Tribal traditions here are alive and well. The sangoma calls on the spirits. One of the author’s many African mamas. Walking to the beach, I’m passing numerous circular huts, homes of Xhosa families that dot the green hillside. Cows meander along the mud road and women walk past with babies strapped to their backs. A strong smell of flowers guides me down from the cliffs, onto the beach, and into the warm water. I’m on my surfboard paddling... left, right, left, right, the wave’s taking me, but I’m tumbling into the Indian Ocean as something distracts me. 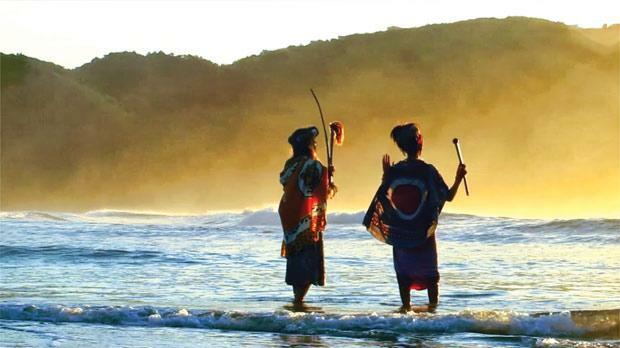 In traditional white dresses, 20 villagers are walking towards the water, accompanied by a sangoma, a witch doctor. To the beat of a drum the doctor calls on the spirits, a lady wearing a giant feather hat kneels in the water, and they’re all probably thinking why this hairy, white man is trying to stand on a plastic board in the ocean. It’s this mix of local life and tourist pleasures that makes the Wild Coast so intoxicating. Ask a South African their favourite local destination and most will say the Wild Coast, the strip of rugged scenery in the southeast of the country between Durban and East London. Much of it is in the Transkei, a region which was independent from South Africa during apartheid years. This separation has enabled it to retain much of its indigenous culture. My journey started in Port St Johns, 225 metres above the ocean on the cliffs that witnessed Leonardo DiCaprio’s death in the movie Blood Diamond. Deep in the surrounding hills are hidden waterfalls, cliff jumps and the largest beach caves in the Southern Hemisphere. Tempestuous waves crash against cliffs as pods of dolphins swim past, and men stop for a chat as I hike through the jungle. Where are they going? These strangers in sandals too flimsy for mud, and smiles too broad for a daily commute... Perhaps to seek advice from the sangoma, the witch doctors who appear everywhere with their trinkets and armies of followers. There are few roads to follow, the coastline too ravaged by nature for anything more than rutted trails. And there is little for the roads to connect. Villages are tiny and infrequent, almost everyone living self-sufficiently from the land. Over a hearty cup of maize beer a local explains the process of acquiring a plot. They must visit the tribal chief with a gift; preferably a cow. The chief allocates some land, a free loan, but one which can be revoked if they misbehave. It’s a traditional method that shows Africa was generations ahead of Karl Marx and Joseph Stalin, with the land officially belonging to ‘the people’, but with a few gatekeepers getting fat and greedy. Like Port St Johns, Coffee Bay is an isolated destination, tucked into the creases of rolling hills. I was learning (and failing) to surf when these ceremonial locals arrived. They all drink maize beer, a sloppy concoction resembling curdled milk littered with breadcrumbs. In the hills, three women cook another batch, stirring cauldrons of intoxication to celebrate a new baby arriving in the village. It’s horrifically sour, and the texture makes me gag. Fortunately it’s not rude to reveal my impressions of the local brew; there is always an old man happy to finish what I reject. Women stand at doors waving, children run around content and excited, and I sense that the locals prefer their more traditional way of life. They’re proud of their roots, and proud of their part in fighting apartheid. Nelson Mandela is from around here, as well as many of the forefathers of the African National Congress, South Africa’s current ruling party. While the party gathered momentum in the township of Soweto, it was this rural area where men like Oliver Tambo and Mandela’s successor, Thabo Mbeki, were born and raised. Life moves slowly around here, and relaxing into the rhythm is an essential part of the experience. Showcasing their local culture, I come across two backpacker hostels owned by the community. Mdundi and Bulungula are tiny Xhosa villages, and their basic accommodation shows how sustainable tourism can empower a local community. Overlooking virgin beaches they’re relaxing paradises, yet my time is not spent on the sand. In the village, locals sit me down and pass on long-winded tales of the past; of witch doctors cursing invading armies; of livestock thieves being banished, and of the raucous parties that accompany every birth and marriage. Younger men discuss their problems; they’ve found a girl but can’t afford the labola, the 10 cows that must be paid to the bride’s family before they can marry. 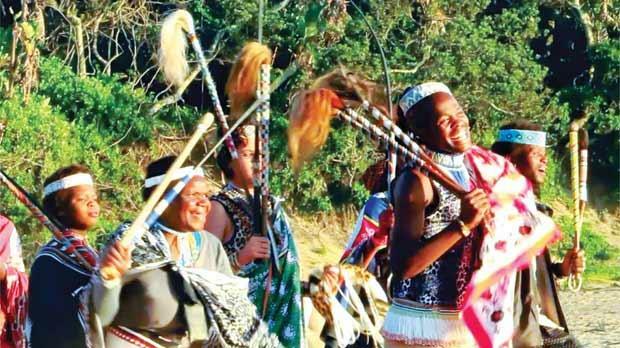 South Africa has a reputation of being the continent’s most developed country, but long-standing traditions continue to dominate the Wild Coast landscape. Each backpackers’ hostel employs a never-ending succession of locals, all full of smiles and jokes, each pressing their claim to be my African mama. 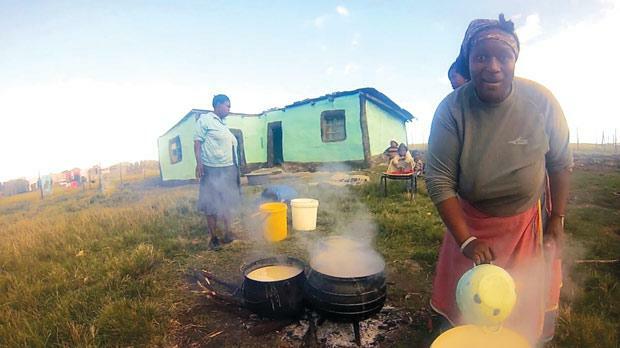 One lures me with food, cooking up a giant pot of pap – a pulverised maize meal. Another puts an arm around me before telling me it is her I can confide in with my problems. And a third promises a younger brother who will show me all the village watering holes; maize beer only, of course. I’m tempted to say the Wild Coast is an area that time forgot, its lack of development affording a unique glimpse into the South Africa of old, the pre-apartheid South Africa. Life continues here like it has done for centuries, and surfboard-wielding tourists are sometimes the only clues that you’re in a modern country in a modern time. And I doubt that long-held traditions will ever die. One of my new mamas takes me aside and gives me an inquisitive look. “I’ve seen you in the water, you are not very good at surfing.” I admit to my tribulations as a beginner.